The home furnishings category includes a wide range of goods, from inexpensive, easy-to-ship towels and dishes to major, bulkier purchases like sofas and rugs, which are usually bought with more research and consideration. Every year, though, shoppers grow more comfortable with making even these larger purchases digitally. As in other sectors, there are a few digital commerce leaders that stand out in this space, helped in part by catalogs and showrooms. The home goods and furnishings sector is benefitting from millennial shoppers coming of age. This younger group is settling down, decorating homes and bringing their comfort with buying digitally to the category. Home furnishing stores are on the forefront of retail’s move to enhance the in-home and in-store experience, through the use of technology (artificial intelligence and augmented reality, for example) and brand extensions (including hotels). 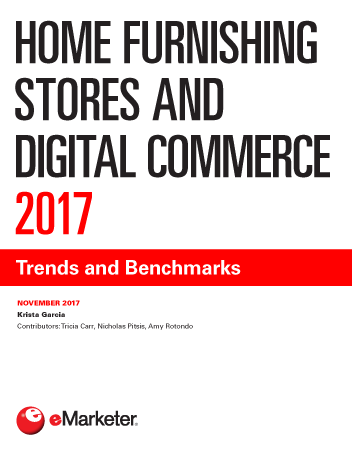 "Retail ecommerce sales of furniture and home furnishings will grow 16.4% in 2017 to reach $35.95 billion, and will total $62.36 billion by 2021."